Everyone knows the old saying Will Rogers saying “You never get a second chance to make a first impression.” This may be an old saying, but it’s one that rings true even in today’s fast-paced digital world. Whether you run a hotel, an office, or a school, when a customer, supervisor, or parent walks into your facility, you know it takes only a split second for them to form an opinion about how it looks. They will also likely make the assumption that the condition that you, as the facility manager, keep the place in is a reflection of your overall performance. The best way that you can make a great impression is to hire the best commercial cleaning company in the Chicago area. When someone walks into your facility, you want to make sure they are greeted with carpets and hard floors that communicate a high level of care. Hiring a great team of cleaners can keep your carpets looking great and handle any emergencies, too. Geralex can provide you with carpet cleaning services to keep your carpeted flooring looking great and hard floor cleaning to keep the marble shining and the bathrooms at the highest level of sanitation. Your floors can impress everyone when you use Geralex Cleaning Services. Our carpet cleaning services clean allergens and dust mites, as well as dirt and grime out of your carpets, leaving them clean and healthy for employees and all visitors. Geralex uses only green cleaning products, so we won’t be creating another problem while cleaning the carpet. We avoid harmful chemicals and dangerous toxins so besides cleaning the carpet, we make sure that everyone who enters the space from toxins. Many people take their floors for granted and don’t give them the care they need, but this can be a big mistake in business. It may be true that most people don’t know notice the floor, but this is true only as long as the floor is clean. People will notice, and quickly, if there is a big stain or there appears to be a dark runner down the middle of the hallway. It’s human nature that people notice things that are different, and in this case, dirty carpets will definitely be noticed. We live in the social media age, and it takes only one post or a number of negative reviews that go viral to have your reputation in shreds. 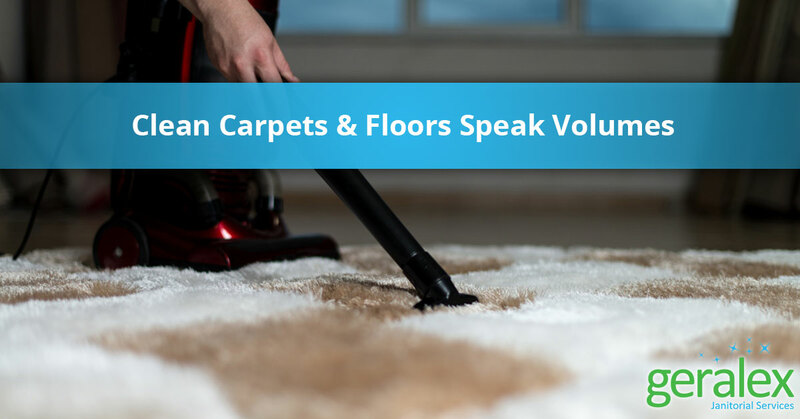 It may be ironic that it takes lots of effort to go unnoticed but in the case of carpets, flying under the radar is the goal and will help keep your good name intact. When you need clean carpet, call Geralex and get on the regular cleaning schedule. If you have an emergency that needs immediate attention be sure to get ahold of us and give us a chance to impress you! To learn more about our full janitorial commercial cleaning services, give us a call today.